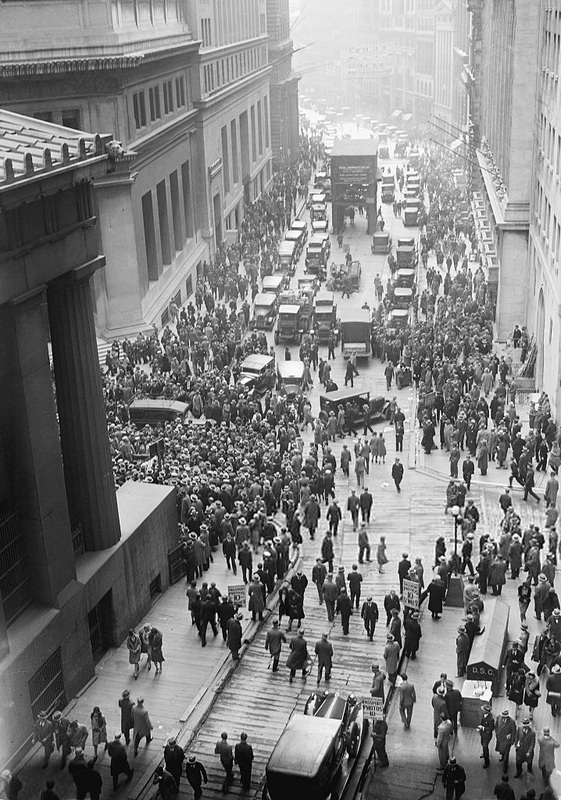 It happened on the New York Stock Exchange on Tuesday October 29, 1929, now known as Black Tuesday. The crash started the Great Depression and stock prices did not reach the same level until late 1954. The crash signalled the beginning of the 10-year Great Depression that affected all Western industrialized countries. It did not end in the United States until the start of American mobilization for World War II at the end of 1941. 15 million people had unemployment coming to them after the banks crashed. "Anyone who bought stocks in mid-1929 and held onto them saw most of his or her adult life pass by before getting back to even". Richard M. Salsman. Stock-exchange speculation led hundreds of thousands of Americans to invest heavily in the stock market. Many were borrowing money to buy more stocks. The amount of money out on loan was more than the entire amount of currency circulating in the U.S. at the time. ↑ Bone, James. "The beginner's guide to stock markets". The Times (London). Archived from the original on May 25, 2010. http://web.archive.org/web/20100525124235/http://www.timesonline.co.uk/tol/money/reader_guides/article6250577.ece. Retrieved January 29, 2012. "The most savage bear market of all time was the Wall Street Crash of 1929–1932, in which share prices fell by 89 per cent." ↑ "Stock market crash of 1929". Encyclopædia Britannica. 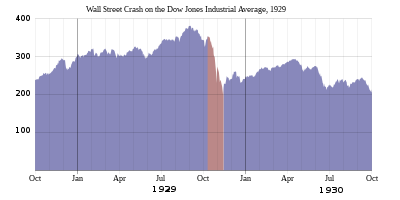 http://www.britannica.com/EBchecked/topic/566754/stock-market-crash-of-1929. Retrieved January 29, 2012. ↑ Lambert, Richard (18 July 2008). "Crashes, Bangs & Wallops". Financial Times. http://www.ft.com/cms/s/0/7173bb6a-552a-11dd-ae9c-000077b07658.html. Retrieved 30 September 2008. ↑ Facing the facts: an economic diagnosis. http://books.google.com/books?id=v3-1r1gHcb4C&pg=PA14&lpg=PA14&dq=volume+of+dollars+in+circulation+in+1929#v=onepage&q=volume%20of%20dollars%20in%20circulation%20in%201929&f=false. Retrieved 2008-09-30. This page was last changed on 14 December 2014, at 02:02.